I’ve been coming down to San Leandro and San Lorenzo for many years now, and have been noticing the big blue Walmart sign in the parking lot that straddles the two cities’ borders every time. As the tallest structure within miles, it’s hard to miss. 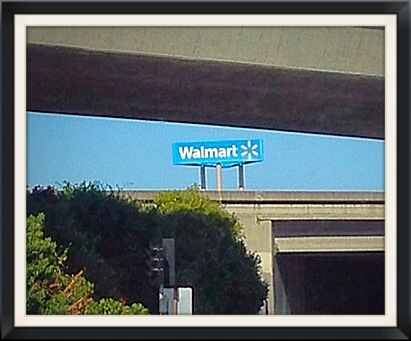 The very notion of a Walmart in the Bay Area is intriguing. It’s a franchise I associate with the conservative heartland of America rather than the liberal Bay of San Francisco. The fact that there’s a Walmart in San Leandro/San Lorenzo lets you know they aren’t your stereotypical Bay Area communities, yet. These are still meat and potatoes postwar working-class suburbs, but who knows for how much longer with the red-hot tech economy’s relentless march forward. Greater San Jose is creeping up from the south, and the booming East Bay market is encroaching from the north. The only untouched stretch of working class post-WWII suburbia left along the San Francisco Bay is this shrinking quadrant in the southeast from Fremont to San Leandro. After driving past this Walmart once a week for so many years, and having finished my work early that afternoon, I realized that I was all out of excuses, and this would have to be the day I parked the truck and finally went in. Normally the merest hint of any kind of “greeter” waiting just inside a doorway to make obligatory eye and voice contact with me is an instant deal breaker. I’m certain that this specter was the biggest single obstacle keeping me out of Walmart for so long. But this afternoon I was going in either way. There would never be a better time. Still, I waited out in the parking lot to let a family of five enter the store’s threshold first. I slipped in just behind them so that they would absorb the brunt of whatever glad-handing greeter happened to be in the wings, waiting to take us by surprise as our eyes adjusted from outdoor to indoor light. When those doors slid open, I was so caught up in the act of blending in that I forgot to notice if there even was a greeter. Once inside, I felt a little like Hunter S Thompson checking into his Vegas hotel, witnessing apocalyptic America in all its guts and glory unfolding before my eyes. I was surprised at how everything appeared disheveled. Somehow I was expecting there to be a Midwestern orderliness to the place, but no. Large sections of shelves were bare. Others were in disarray. It looked like a store after a horde of panicked people rushed through to stock up on emergency provisions ahead of a hurricane warning, or like it had just been looted by the same horde after a hurricane evacuation shut the town down. Once my eyes adjusted, I began to notice the Ellis Island feel of the place. Everyone in the store seemed like an immigrant. There was a palpable energy, bustle, and optimistic chaos, the stuff that American progress is made of. The next thing that caught my eye was the novelty of seeing prices in pennies–bins of stuff under large signs that read .74 or .59, with no number to the left of the decimal point. It seemed like a typo or a trip back to the pre-inflationary 1970s. Seeing ¢ instead of $ in 2014 is a surreal visual, and totally worth the price of admission for just that alone. It’s true what they say about Walmart; it is full of people in Rascals and mobility scooters of all kinds. In fact, there were tons of sick people up and down the aisles. It sounded like a TB ward in there. People hacked and sneezed in rapid, perpetual fire while they shopped, with no shame and no attempt whatsoever to cover up their mouths and noses as they handled the merchandise. It felt like the kind of place where you could easily walk out with a case of pinkeye and consider yourself lucky it wasn’t anything worse. Gradually, the novelty of Walmart began wearing off. As I moved through the store searching for new and unusual items and experiences, trying to stay one step ahead of the serial coughers and sneezers, one guy was strutting slowly up and down the aisles barking orders into his cellphone. Based on what I heard, I’m pretty sure he was putting out a hit on his old lady. Based on what he wore, I’m pretty sure he worked at that Walmart. Another loud guy on a cell phone was dragging around a little kid as if by the ear, sounding like he was trying to get a flurry of off track bets in under the wire. I’d had quite enough, but it would have been like spending a week in Vegas and never pulling the handle on a slot machine to come out of that shopping mecca empty handed, so I kept sweeping through the aisles until hitting pay dirt in the form of pegboard hooks. I was pleasantly surprised to find them at a price in line with their actual value instead of a price that made me feel like a sucker. You see, a couple of years back I got a bunch of pegboard at a low, low price and felt very proud of myself for having sniffed out such a bargain. But after spending a Saturday mounting the pegboard all over the surfaces of my workroom, I quickly discovered that pegboard is a lot like men’s razors and computer printers. They lure you in with cheap fixtures, but then they get you on the accessories that go with it–the razor blades and ink cartridges that you constantly need to refill. And so it is with pegboard. The board itself is dirt cheap, but the hooks that go in it are significantly more dear. 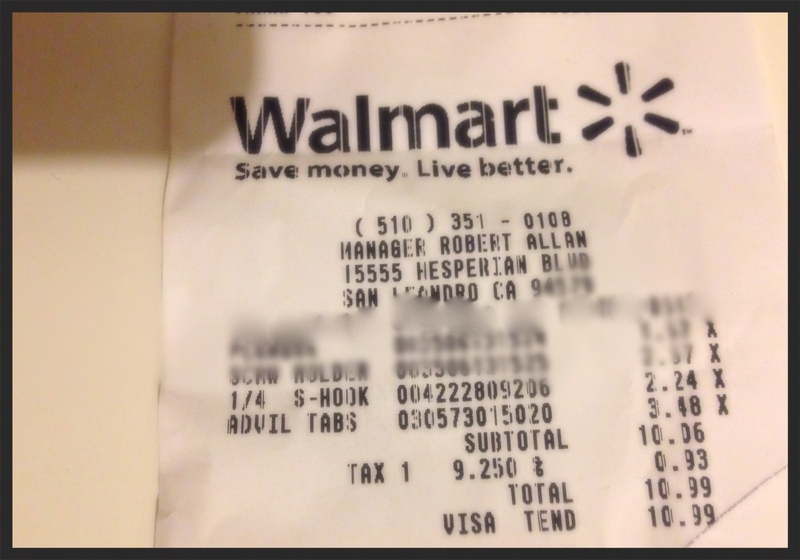 So I was glad to see that Walmart had these items for two bucks a packet instead of five. On the way out, I made an impulse buy of a bottle of Advil for the headache the store gave me. It would serve me well that day. Maybe there really is something for everybody at Walmart. But is the benefit worth the cost? As for me, I come from a subculture that blames Walmart for nearly all of society’s woes of the last 20 years. America, it would seem, has sent all its jobs overseas and shut down all its mom and pop stores so that the heirs of Sam Walton can further multiply their billions. I’m glad I went in and saw the store for myself, because I am no longer as cowed by the company. Sure, our old blue collar economy has been gutted in the last few decades, but I now believe there’s no way one chain of glorified K-Marts could exert that much geopolitical influence for good or bad. I see Walmart now as something symbolic or synechdochal, a part that stands in for the whole, like how the Google bus has come to represent everything that’s wrong with the new San Francisco, and how getting rid of the bus won’t solve the underlying problem.